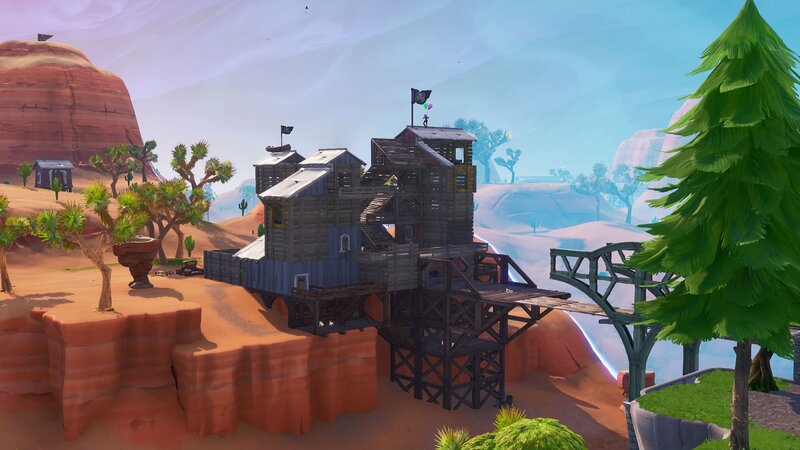 Learn how to complete the challenge to visit three Pirate Camps in a single match in Fortnite. The latest batch of weekly challenges for Fortnite Season 8 are here, bringing new tasks for players to complete. One of the latest challenges tasks players to visit three Pirate Camps in a single match. Since the camps are pretty spread out, we’ve put together this handy guide to help you visit three Pirate Camps in the same match with relative ease. There is a total of seven Pirate Camp locations situated around the Fortnite island. Thankfully you’ll only need to visit three of them to complete this challenge. Because of how spread out they are, though, completing this challenge might be difficult. That’s why we’re here to help. All the Pirate Camp locations in Fortnite Season 8. If you take a look at the map above, you can see the seven locations where Pirate Camps can be found at. 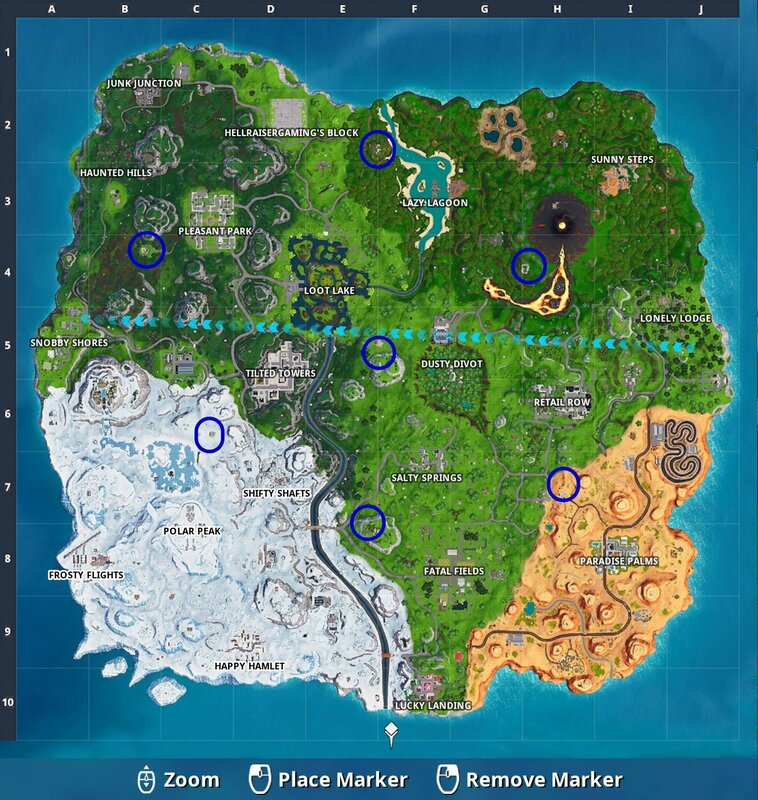 The easiest camps for you to visit in a single match can then be found near the central area of the map, close to Shifty Shafts and Salty Springs. To complete this challenge you’re going to want to drop into the match just west of Dusty Divot. 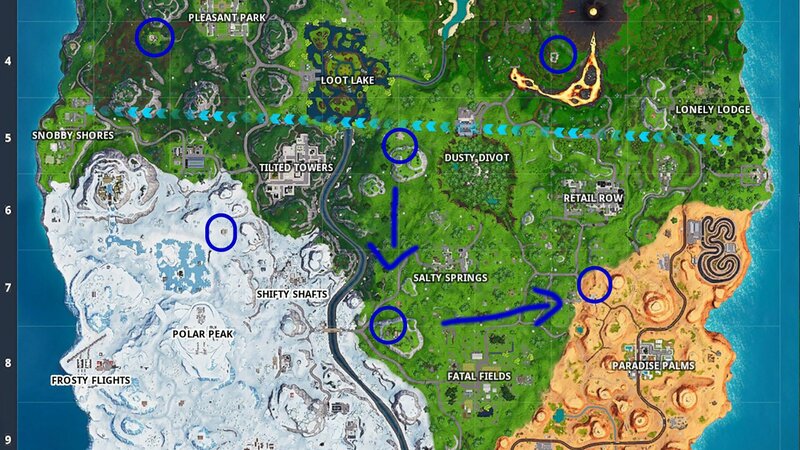 From here you can make your way directly south—just past Salty Springs—to the Pirate Camp southwest of the location. Visit this Pirate Camp and then immediately head eastward towards the desert biome that runs along the southeastern edge of the map. The Pirate Camp that rests on the border of the desert is your final stop. Follow the path above to complete the challenge to visit three Pirate Camps in a single match. That’s really all it takes to complete the challenge to visit three Pirate Camps in a single match. While it might seem tricky, you can easily pull it off in Team Rumble, where you’re able to freely respawn if you end up dying before you finish visiting all three locations. When you’ve finished the challenge, make sure you check out the other Season 8 week 7 challenges, or find out how to find the secret Battle Star in week 7.